Paths in and through the Garden are made of compacted gravel and are firm, flat and stable. They are accessible to most people, including those pushing strollers and using walkers or motorized chairs. The greenhouse (staffed with volunteers) is open Fridays and Saturdays 10:00 am to 2:00 pm from May through October. We sell clematis only during those hours. 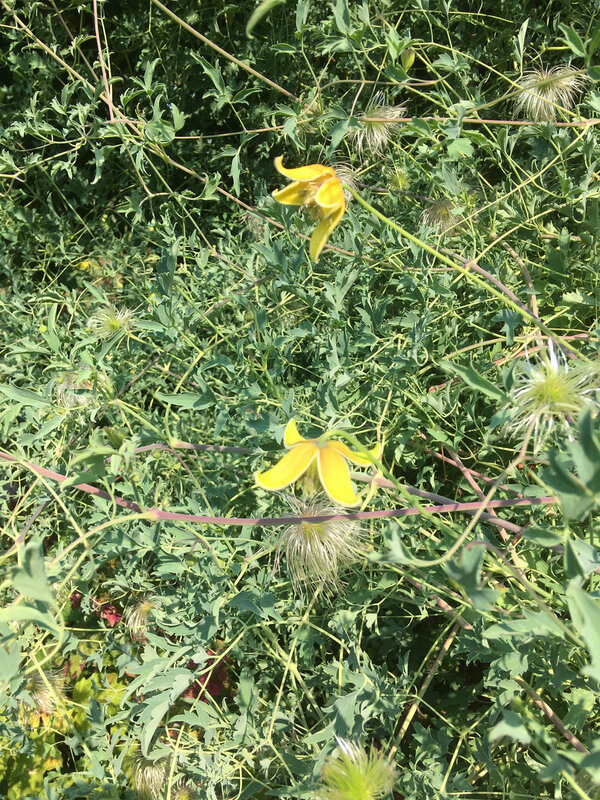 Evergreen and winter-flowering clematis are for sale all year round while supplies last on Fridays from November through March. We cannot accommodate mail order sales, and we cannot hold plants pending your visit. All sales are first come, first served. Hyper-tufa Trough Making (January 15 through February 28/29). Private classes cost $25 per person ($10 for a FRCC member in the group). All materials are provided. Attendees may become a member at the class, and enjoy the discounted rate. All classes are held in (or just outside) the RCG greenhouse. Dress for the weather. Space is limited to 15 people per class. Request a private class. 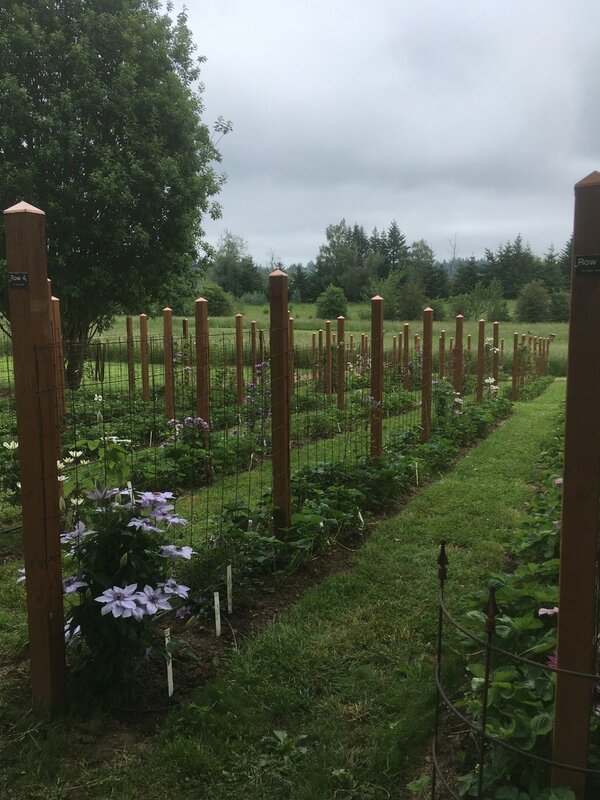 Evocative of the old apple orchard that once stood on these grounds, heirloom apple trees on dwarfing rootstock are grown in a grid pattern in the Orchard Garden and are surrounded by beds of shrubs, roses, lilies and, of course, clematis. Buds and blossoms climb through stalks of lilies and drape over bushes. At the far end of the garden, you will see the gnarled old Gravenstein apple tree from the original orchard. Apple map: Hudson's Golden Gem, Bed 15 (southern Oregon, 1930s); Mother, Bed 16 (Massachusetts, mid 1800s); Gravenstein, Bed 17 (tree as found at farm, cultivar from Denmark, 1797); Roxbury Russet, Bed 17 (Massachusetts, early 17th century); Westfield Seek-No-Further, Bed 18 (Westfield, Massachesetts, 1700s); Hubbardston Nonesuch, Bed 19 (Massachusetts, before 1832); Esopus Spitzenberg, Bed 20 (Esopus, New York, early 1800s); Yellow Bellflower, Bed 21 (Burlington Co. New Jersey, 1742); Arkansas Black, Bed 22 (Arkansas, 1840s). The Founder’s Garden, located around a lovely sundial, contains over 40 of Brewster Rogerson’s favorite clematis, chosen for both aesthetic and sentimental reasons. Collected over the course of more than 40 years, this garden represents a unique assortment of clematis displayed among conifers and winter-flowering shrubs to show the vines to their best effect. Comprised of Bed 16. Along the length of the terrace outside the greenhouse is a hedge of evergreen Viburnum tinus, a perfect host for the spring-blooming alpine and Korean clematis. Both the hedge and the clematis bloom exuberantly in April and May. The clematis rebloom throughout the summer, joined by shrubby clematis (yes, clematis that are woody shrubs!) from July through September. Contained in Bed 23, with an extension added with a Yew hedge (Taxus baccata 'Fastigiata') providing the garden's northwest boundary, in 2014-15, Bed 24. Outside the west face of the greenhouse is a long rock-edged bed with five large trellises and several forms of Pittosporum tenuifolium, a highly ornamental species of evergreen shrub from New Zealand. It is here that we prove our claim of having clematis in bloom all year round. Winter-flowering species Clematis cirrhosa and its charming selections populate the trellises and shrubs, flowering from November through March. Harsh weather may stop their flower-fest briefly, but they always bounce back! The Beech Tree's Garden, has been thoughtfully planted to attract songbirds and hummingbirds, which has earned the designation as a Backyard Bird Habitat by the National Wildlife Federation and certification as a Silver Backyard Habitat by the Audubon Society of Portland and the Columbia Land Trust (Beds 1-4). The entire Rogerson Clematis Garden is one of the few wholly organic ornamental gardens in a public park in Oregon.